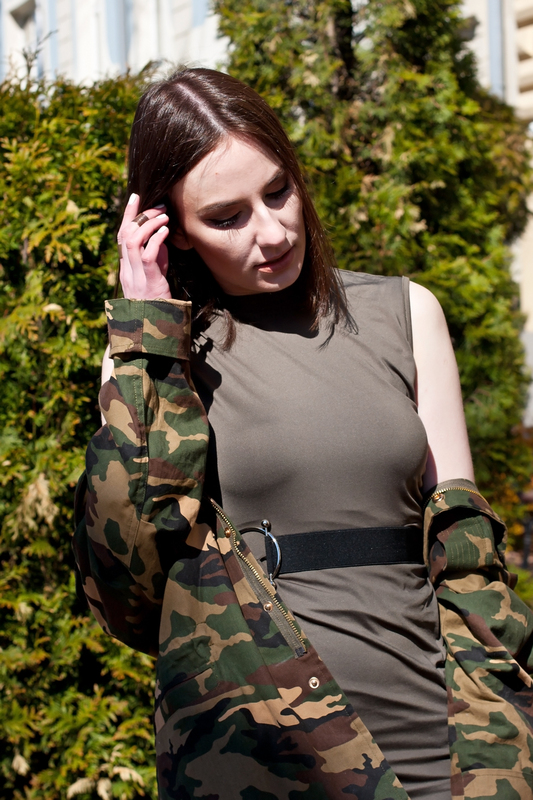 Or where military vibes meet bodycon stuff. Was it just few weeks ago when I was talking through my camo print obsession and was literally trying to beat that desire to multiply its amount within my wardrobe? Yes, am still holding myself away from this idea. Well, military direction is much more than just camouflage... take combat boots and endless number of khaki shades. Looks like I've been putting military vibes into my fashion arsenal for quite some time now... since like the beginning of this year I would say. Therefore, I couldn't deny this army green dress piece. Speaking of military style in general and historical terms, I find it... I don't know... interesting to some extent maybe, that this type of clothing in civil life was actually used as a sort of protest against military policies. It was 1960's era and American youth was standing against war in Vietnam. It was an increased interest in military direction from designer side in 1980's, an era that marked with many and many military conflicts around the globe. And it's an endless military drama of the 2000's and 2010's. Right. Military vibes don't pop up in fashion just like that, you know. As they say, fashion is a reflection of a time. Of a certain decade. Same goes to this or that style direction. It's a reflection. When it comes to today's outfit, as I said above I couldn't deny this dress. As well as lace-up shoes and a belt. And I totally love how the three came together in one outfit. Was not sure if the belt would fit, when placing an order with Sammydress. But, well, you see the result. I also love how feminine military style can be, aggressive and daring, but still feminine.